There are many hunting applications for airguns: shooting pest species in low light at close ranges, small-game hunting in heavy woods or desert scrub, long range varmint shooting. Each of these places different demands on a scope. How Will The Scope Be Used? Another factor to consider is the bi-directional recoil of spring-piston airguns that wreak havoc on standard optics designed for firearms, so scopes used on springers must be designed to cope with these forces. While some consider airgun scopes to be of lower quality than conventional scopes, they are actually built stronger to cope with the unique recoil. Parallax correction for standard firearm optics is generally set at 100 yards. Whereas for airguns this is reduced to 50 yards or you’ll need an adjustable objective lens (to correct parallax). Which, by the way, makes a quality airgun scope ideal for mounting on a .22 rimfire, if shots are frequently smaller targets at 50 yards or less. When using an airgun for hunting, precise-shot placement is required and variable- or higher-magnification scopes are my preference. My favorite is a 3-9 variable, which I use on everything from small-game guns to big bores. On rifles used for long range culling of prairie dogs, I’ll opt for higher magnification. Trying to consistently hit a target the size of a quarter at 125 yards is easier when you can crank it up for a closer look. At the other end of the spectrum are urban-hunting guns, used for pest control where short-range shots in low light are the norm. I like the 4X to 6X range with a long eye relief that provides some magnification with fast sight acquisition. The larger the objective (front lens), the better you’ll be able to see your target in dim light. The tradeoff with the large forward lens is you have to use a higher mount, which could impact sight alignment depending on your rifle’s stock. The other thing to decide is whether you prefer the traditional 1-inch scope tube or the larger 30mm tube. The 30mm tube facilitates transmission of the light gathered at the objective to the shooters eye (if the internal tube is also larger), but it’s bulkier and you’ll need to make sure you get the right mounts. In the past, when you bought an airgun scope you had little choice in crosshair styles. Then somebody discovered that mil-dots could be useful as a fast reference for dealing with the pronounced trajectory of airguns. Another revelation was the introduction of illuminated reticles, which are useful in low light conditions. Both features are now found on many models specifically designed for airguns. What’s Available? I’ve used scopes produced by Leapers, Hawke, Bushnell, and CenterPoint. Leapers has been manufacturing airgun scopes for many years. Their models range from fixed power compact scopes up to high magnification sniper models. Many of its scopes come with illuminated reticles, adjustable-parallax correction, mil-dots, and represents one of the most extensive product lines available. They also offer a line of adjunct gear such as lights, lasers and mounts. I have several Leapers scopes on my hunting guns, and even though they focus on budget-priced products, the optical quality and ruggedness of these scopes is impressive. During the past year or so I’ve been using Hawke scopes quite a bit. Two models I really like are the MAP Pro 3-9x50 and the Eclipse. The Map Pro utilizes the company’s multi-aim-point reticle, which was designed to work with their BRC advanced ballistics program. This allows the shooter to plug in information on the pellet and the rifle’s muzzle velocity. Reference points on the reticle are then mapped to a specific range for a given rifle. Pretty slick when reaching out for longer shots! The Eclipse is built on a 30mm tube (with scaled up internal tube dimensions), and I like the sharp image quality even under very low-light conditions. Crosman has been making major inroads into the hunting-airgun market. 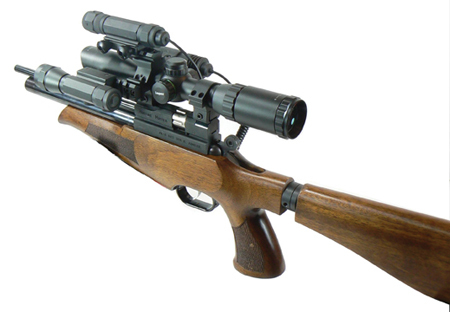 Part of that advance has been the addition of an extensive range of airgunning scopes. Its CenterPoint line has several new models. I’ve been using the 3-9x42 30mm on one of my carbines, the images are sharp and clear, it has proven to be very robust, and it’s a compact package that fits well on smaller guns. I’ve used Bushnell scopes on firearms for years, but recently I’ve been using their Legend 3-9x40 on air rifles. The scope offers excellent image clarity and light-transmission characteristics, has an adjustable AO, and a streamlined design that now sits on top a beautiful Beeman Falcon R rifle. It’s a great time if you need a new airgun scope. The variety and quality of glass available has never been better. After determining how you’ll be using the scope, what features you want, and how much you want to spend, take a look at the manufacturers mentioned above and I’m sure you’ll find one that meets your needs. Following are a few of the companies producing airgunning optics that I’ve had good results with. You can also go to the many online airgun shops, which often offer a one-stop shop for all the scopes mentioned. 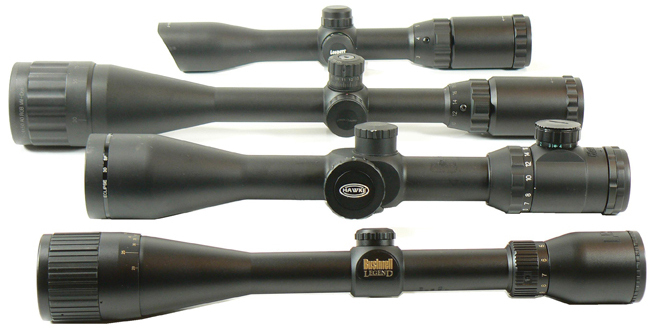 CenterPoint Line of Airgun Scopes: Offering more than 20 models of airgun scopes at great prices. A wide range of scopes with innovative reticle design. Free download of the BRC ballistics program! Huge selection of airgun scopes, lights, lasers, mounts and more. Fewer airgun scopes, but great selection of binoculars, range finders, and spotting scopes.